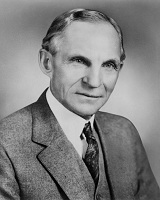 Henry Ford 30 July 1863 7 April 1947 American William Ford Mary Litogot Ford Entrepreneur, Business magnate, Inventor, Industrialist, Engineer, Businessperson Creator of the Ford Model T car in 1908. Ford sold millions of cars and became a world-famous company head. A list of popular Hindi Henry Ford quotes are given below.